The game of triumphs seems to have been very popular in Rome from the early 1460s. The research of Arnold Esch shows that Romans imported it by 1474 already, but his more recent 2007 Economia, cultura materiale ed arte nella Roma del Rinascimento: studi sui registri doganali romani 1445-1485 pushes its arrival back more than a decade. He mentions the trionfi cards imported into Rome by Florentine mercers and recorded in the customs registers. One 1464 entry even mentions a huge number, “para 309” – 309 packs! Like Marchione Burdochio of Bologna, these mercers dealt primarily in fabrics, but their customs lists show they had other stuff as well. And Florence seems to have been a factory of triumph cards. A big importer was Pierozzo di Ser Francesco (also written Pierozo once). The book is only "snippet view" which is why some quotes are unfinished. P. 128 mentions him in the 1470s as well. “...fino al 1464, nei registri doganali viene menzionato ancora con ogni ben di Dio: “merce minute di Milano”, tele di Costanza, stamigna francese, bonette, triunfi (“para 309”, “para 24”) ed altre carte da giocare, cimbali, “20 pugnalli indorati”, 2.130 pugnali." ... about playing cards from Gaeta. Esch seems to have written some of the Italian text I quoted above from 2007, in a German article of 1994. Quellen und Forschungen aus italienischen Archiven und Bibliotheken, Volume 74, p. 384. I can't find any mention of Spielkarten or "trionfi" (triunfi), however. Perhaps it is less detailed than the more recent Italian book. Note that "dozenali" means common, ordinary, cheap (modern Italian dozzinale), so "cheap triumph cards" were being imported into Rome by Pierozzo, along with others of slightly higher value - "senza oro". This last note implies that the accountant was familiar with trionfi cards "with gold/gilded" as well. 3 dozen ordinary triumph packs, 1 dozen playing cards: 4 ducats. 4 dozen (48) triumph packs, "without gold" (so presumably the same as "ordinary"), 6 ducats. 48 packs of triumphs, 5.5 ducats. If 5 bolognini = 1.4 ducats, 1 bolognini = 28 soldi (or whatever the smaller measure is; I am dividing by 10 of course, which they probably did not do). The first 4 dozen packs are worth 1.5 ducats per dozen, or 12.5 soldi each. The second 4 dozen packs are worth 1.375 ducats per dozen, or 11.45 soldi each. The average price is therefore about 12 soldi per pack of these triumph cards. The 3 dozen pack of "ordinary" triumph cards must therefore be worth less than the middle two bunches, for the playing cards to be worth anything at all. If the triumphs are, say, only 9 soldi each, that means that three dozen cost 3.24 ducats; this leaves 76 soldi/12 = 6.3 soldi each for the regular playing cards, which sounds about right. However, I have no idea of the relative values of Ferrarese or Bolognese money in the 1440s and Roman money in the 1460s. I also don't get how he gets his estimations of bol(ognini) and ducats, i.e. how 5 bol.= 1,4 ducats - see below. *UPDATE*: on page 90, note 335, Esch notes that one bolognini = 16 denari. "A Roma il fiorino di camera e il ducato di camera allora avevano lo stesso valore (entrambi a 72 bolognini romani: per es. reg. 45, f. 75v, anno 1472: «ad rationem 72 pro floreno seu ducato», e questo vale per tutto il periodo trattato. ), il bolognino diviso in 16 denari." 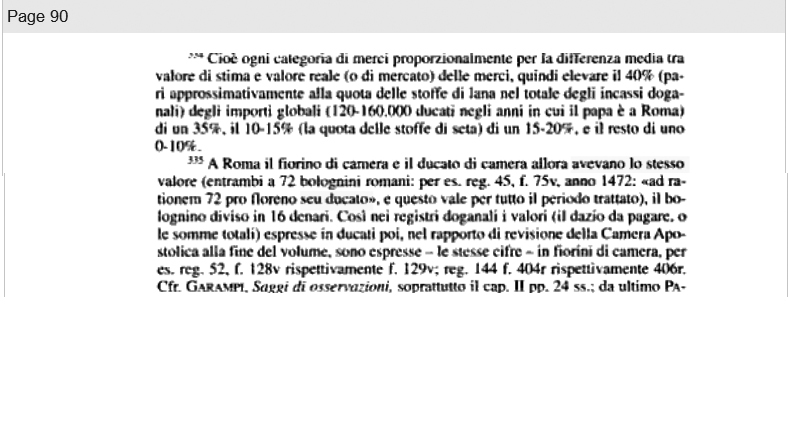 In Rome the fiorino di camera and the ducato di camera thus had the same value (both at 72 Roman bolognini: for example, Reg. 45, f. 75v, anno 1472: "divided as 72 per florin or ducat", and this holds for the entire period concerned), the bolognino divided into 16 denari. So 5 bol. = 80 denari; each pack of the third reference (16 packs) was therefore worth 5 denari (or bolognini, depending on how this system works). 8.25 denari (or bolognini) each. Obviously these would be sold retail for somewhat more. I guess you could think of a ducat as a 72-dollar/euro/pound note. The bolognino is then a single dollar/euro/pound. The bolognino is divided into quattrini, (quattrino, a quarter), and each quarter has four denari, like "nickels" or 6-cent pieces. These are obviously not real equivalences, just meant to give a concrete sense of how they were divided, and only a very rough approximation of value. So given my misapphrension of what Esch reports, the most the packs could cost is 9 dollars/euros/pounds each. The least they could cost is about 54 cents/centimes(eurocents)/pence (9x6). The former sounds more plausible, but who knows? This is really a great find. So.. common, affordable cards for the masses? Does this in any way change your thoughts on Florence? I wish I could figure out how he gets "5 bol. = 1,4 duc. ", but in any case, the cards are cheap, and there are a lot of them. Clearly the haberdasher knew there was a market for them. For Florence, of course - presuming the cards are from Florence, since the second one had "stuff" from Milan and cloth from Costanza, so they could be from elsewhere (it just feels unlikely) - I feel Florence is obviously a factory of Tarot cards, providing for the south. So why not for the north, like Bologna? I don't yet see any aspect to this which adds to the origin arguments (I'm always turning these things in my head, of course), but the main point is that the game was standard, mass-produced, well distinguished from regular playing cards, widespread, and well established by the early 1460s well outside of the early centers, which makes the notion that Tarot was constantly being experimented with and didn't have a standard form much more untenable. Its popularity is something to consider - Rome seems to have had about 25,000 people at most at this time (references to be added), while Florence and Bologna had twice that. And Milan had around 200,000. So, imagine, if hundreds of decks were brought in by one merchant to Rome, how many must have been made and played in the bigger centers? Another point to consider is the Charles VI pack, now considered Florentine, which, at the time it was numbered, had all of the standard subjects in a Southern order (with the possible exception of the Popess), might suggest that, like in Bologna, the Bagatto was not numbered (but neither are any of the Papi), or that, when they were numbered, one of the Papi, presumably the Popess, had been removed (like in the Strambotto). But the rest were all there. The deck dates to the early 1460s at the latest, and if it reflects the standard Florentine sequence and subjects, it suggests what the Romans might have been playing with. "5 bol. = 1,4 duc." Ross G. R. Caldwell wrote: Esch seems to have written some of the Italian text I quoted above from 2007, in a German article of 1994. ... after some years in the 1970s, which he spend in Lucca.